Sometimes we have moments of brilliance on The State of Games. We come up with timely, intelligent points of debate and spend precious moments wringing every bit of knowledge we can muster in an effort to bring something new to the hobby and to our listeners. I’m here to tell you, this podcast isn’t one of those moments. But if you like three guys being random and silly, have we got a show for you. That second colon has sooooo much personality…! 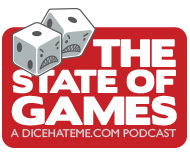 Do you guys check the BGG guild for your podcast? I just posted a question there about ep61 and emergent game play. Thanks for the interesting conversation. That’s exciting news about Compounded being considered for Mensa Select. Congrats to Darrell. Ok. I’ve sent in a correction request on behalf of T.C.’s VJ:TCG:TDG. What a bunch of BGG silliness about formatting. Lighten up guys. To me, “emergent” means that complexity develops from simple rules in unexpected ways. Ants exhibit emergent behavior because each individual ant operates on some pretty basic rules (or “algorithms”), but ant colonies develop complex, evolutionary behavior. So Chess and Go would exemplify emergent game play, because complex strategies and counter-strategies evolve over time, and there is no fixed pattern of gameplay. I think social games might be conducive to emergent game play when people get to know each other and try to finesse and out-think each other. All that being said, I like T.C.’s definition of a micro-game as a minimalist structure that emphasizes emergent play. I do think that Love Letter moves in that direction, although there is, I think, a limit to how far the tactics can evolve. Citadels might be a better example of emergent play with its hidden identities and second-guessing, except that it has too many district cards to be a micro-game.